When new partners go into business together, they are usually excited about the new business venture. As partners, you will find that you will always be agreeing on everything at the beginning of your entrepreneurial venture. 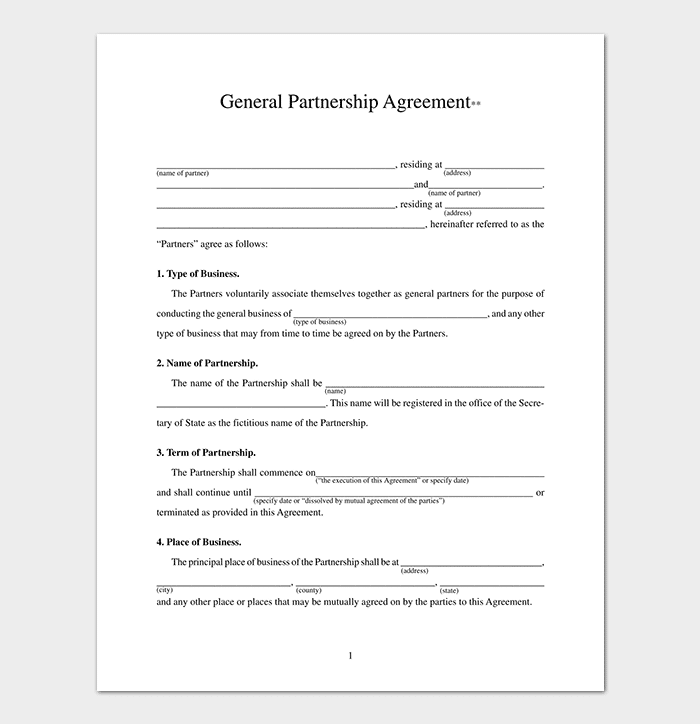 This can make you think that you don’t need a written partnership agreement template. But, there are a lot of things that could wrong. Over time, you may find that the expectations that you have for the business may be different from what your partners have for the same business. 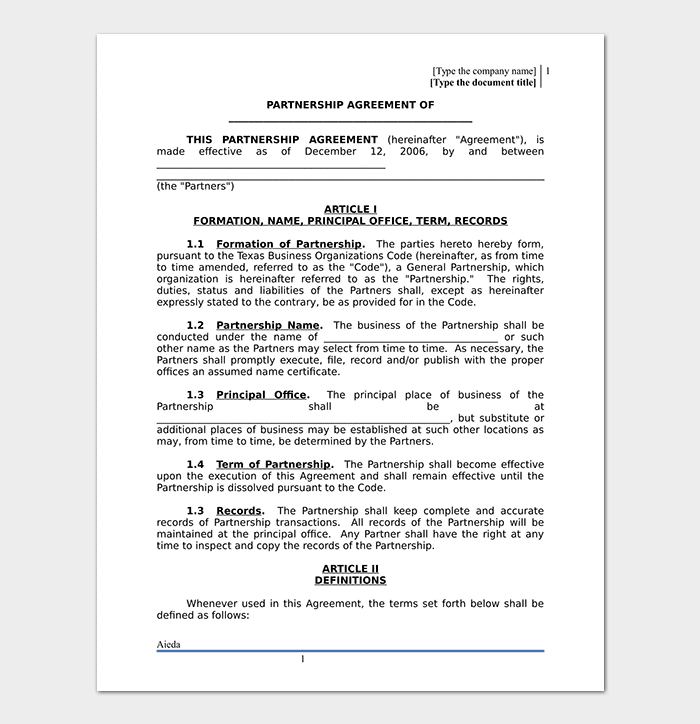 Writing a partnership agreement can help in solving disputes that have been known to arise from such situation. This agreement can help in protecting each partner’s investment into the business and also prevent the entrepreneurial venture from falling apart due to any disagreements which may arise in the future. Which Terms Should Be Included in a Business Template? 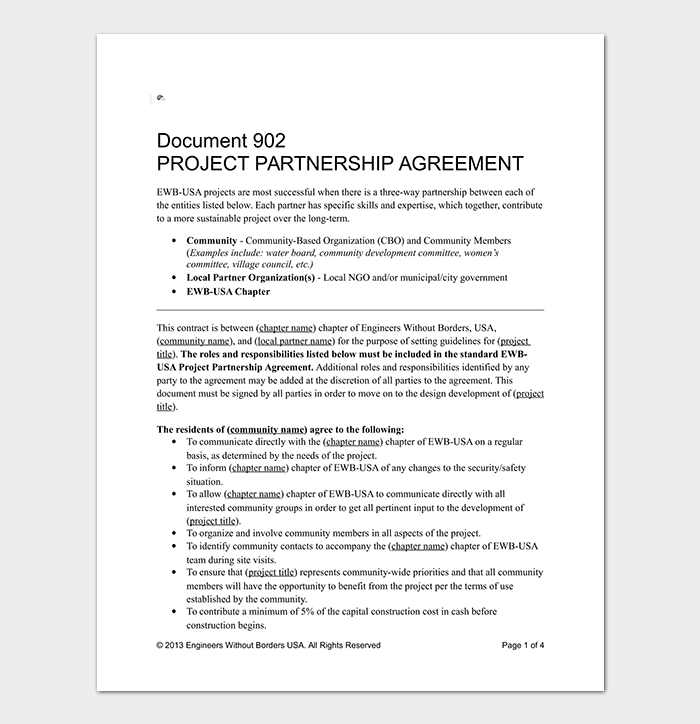 This is a document whose main purpose is to establish a formal partnership between 2 small businesses. 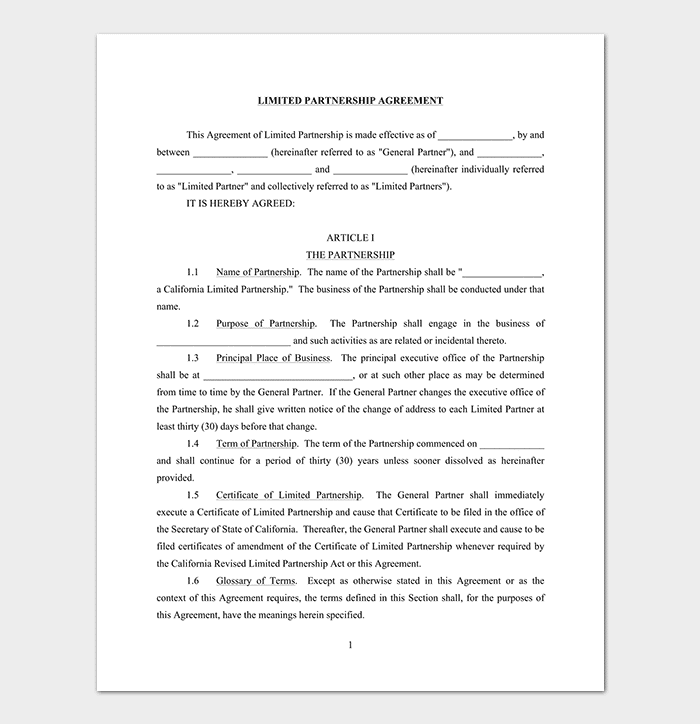 In this agreement, two partners are involved and both of them make capital contributions to help in running their new entrepreneurial venture immediately the partnership is formed. 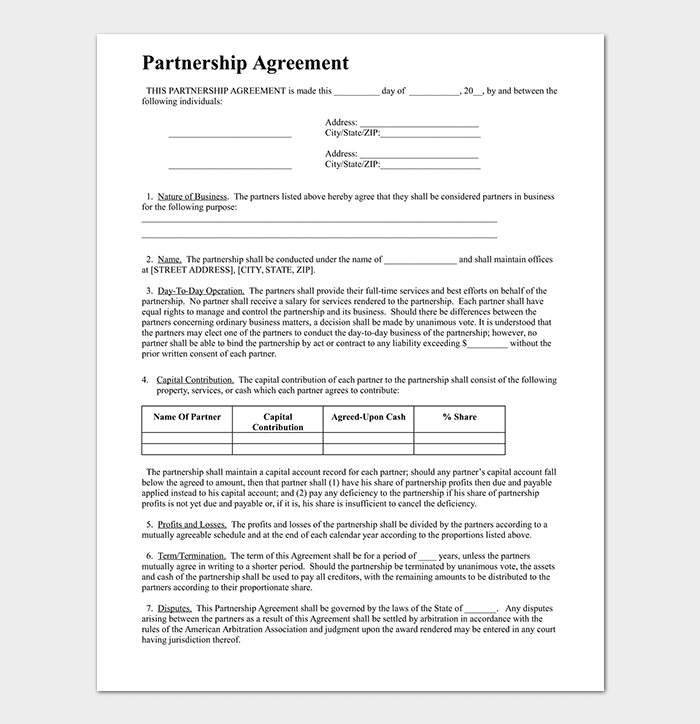 The agreement covers all the terms that are required in order to create the business partnership and also help in solving any misunderstandings between you and your partner in the future. 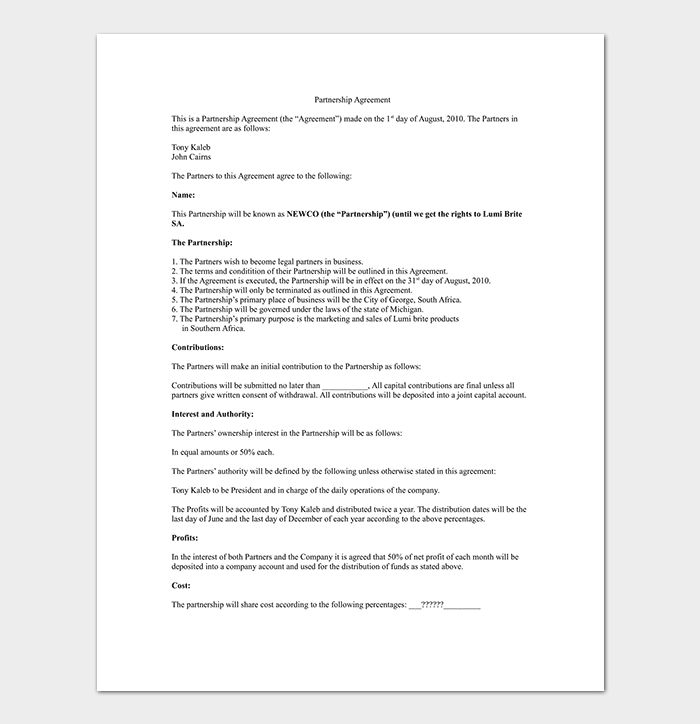 This is a contract that outlines clearly the arrangement between two partners whose aim is to work together in order to launch and grow a business. Since different partnerships will aim at pursuing varying business ventures, business agreements created are usually different. 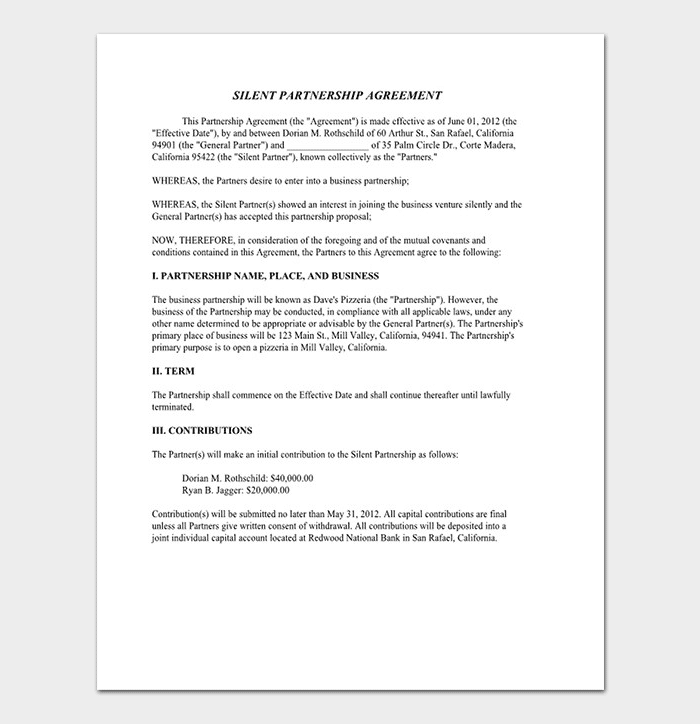 Even though the agreements are different, there are some similar items found in these agreements, an example being a mutual non-disclosure agreement. 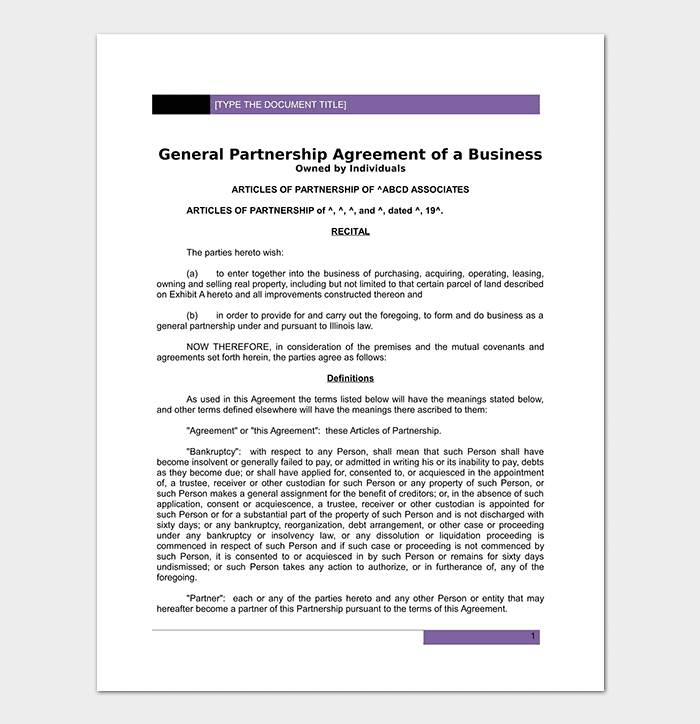 This document is used by business owners to outline the terms that govern each partner’s duties and rights in a business venture. 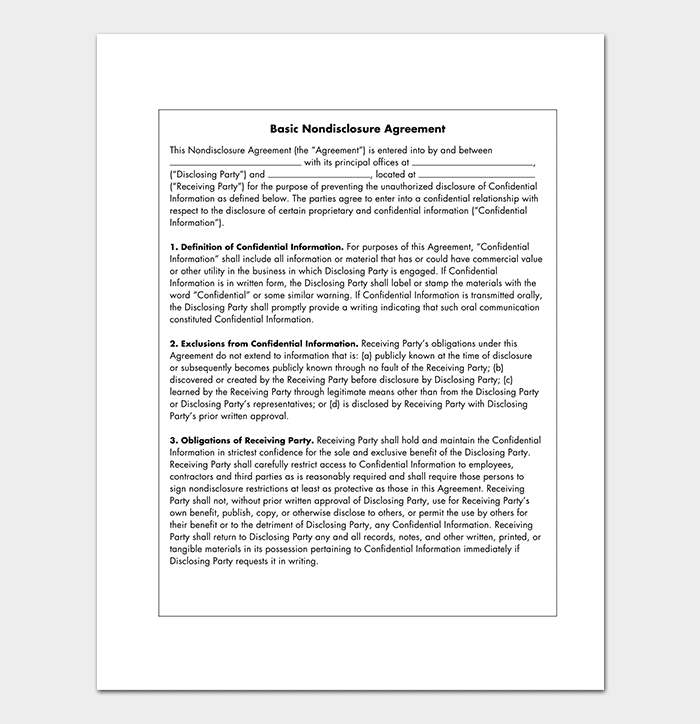 This agreement can also be referred to as a standard partnership agreement. For the agreement to be valid, it is essential for business partners to choose a professional template. A non-professional template may look sketchy and thus it may not be admissible in solving any disputes in the future. Percentage of Ownership – When partners are starting a business venture together, the amount of money that each partner contributes usually differ. The cash contributed may be used to cover the start-up costs that are involved while setting up a business venture or even help in acquiring equipment that the business needs in order to start running.The amount of capital that each partner contributes initially is used as the basis for establishing the percentage of ownership. The more the partner contributes, the more percentage of ownership he or she will have in the business. 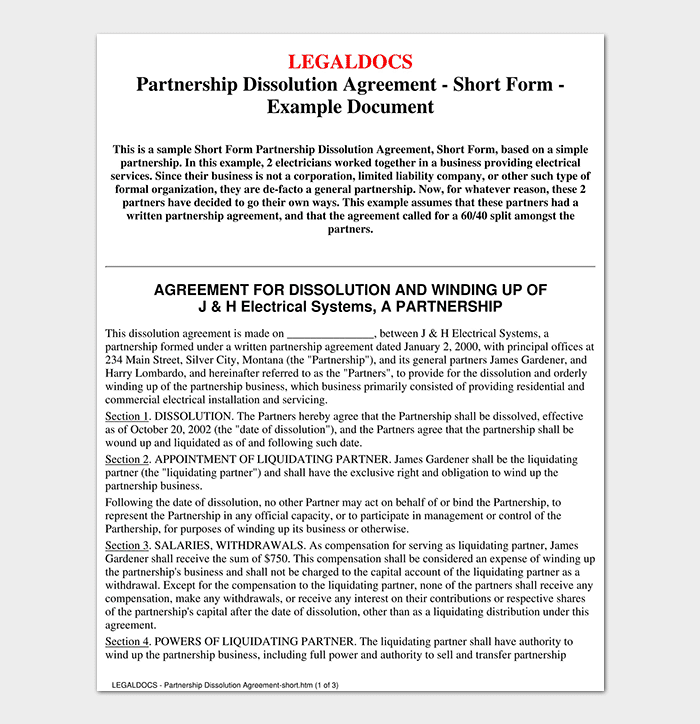 These terms are very important in the business agreement as they may help in solving disputes in the future. How Profit and Loss Should be Divided – Partners may decide to share the profits and losses that come from the business based on their percentage of ownership in the business or they may agree to share them equally regardless of how much percentage of ownership each person has. To avoid conflicts in the future of the partners’ entrepreneurial venture, this term must be included in the agreement. In this term, partners should also agree on when they can withdraw profit from the business. 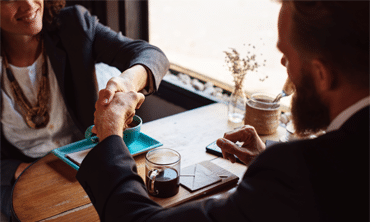 How Long the Partnership Will Last – Although may partnerships don’t have a specified amount of time for which they last, there are some instances in which a partnership is designed to end after a business venture has reached a specific goal. This should be included in the partnership agreement. How to Make Decisions and How to Solve Disputes – One major cause of conflict in a partnership is the lack of a proper procedure for solving disputes. 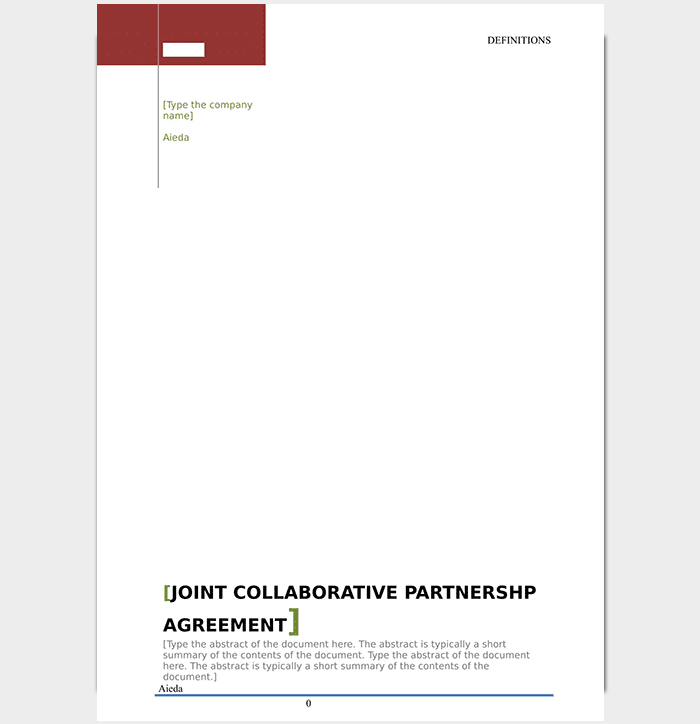 To avoid this, the business partnership template should include a term detailing on how decisions should be made and on how to solve any disputes that may arise. Authority – This is also referred to as binding power. This term should be included, and it should describe which partner has the authority to bind the business and which process should be followed in such a case. This can prevent the entrepreneurial venture from ending up in an unmanageable level of risk due to debts. Death or Withdrawal – The rules that should be followed in case a partner dies or decides to withdraw should be included. The terms should detail the valuation process, or they may detail that each partner maintains life insurance policy and designate all other partners as beneficiaries. 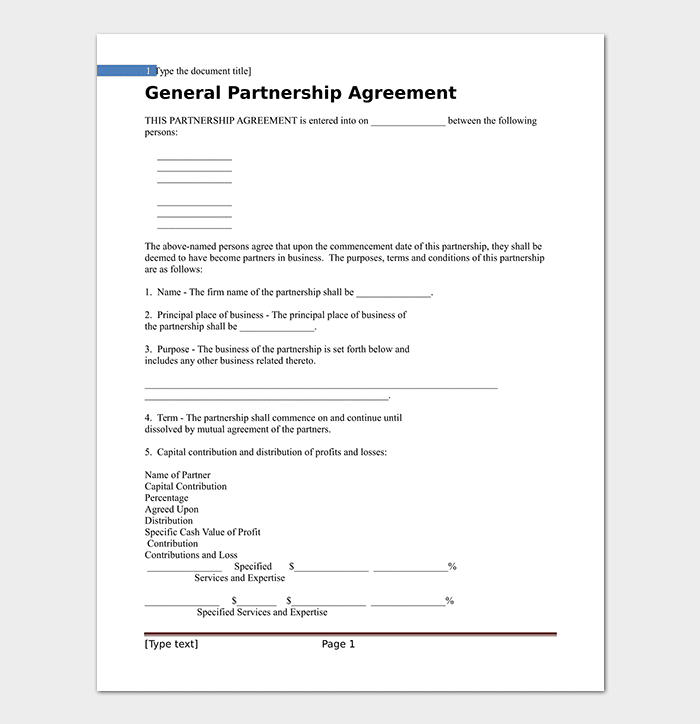 A Business partnership agreement is a very crucial document that people who wish to start a partnership business should have. This simple document can go a long way in helping these people solve disputes that may arise in the future. 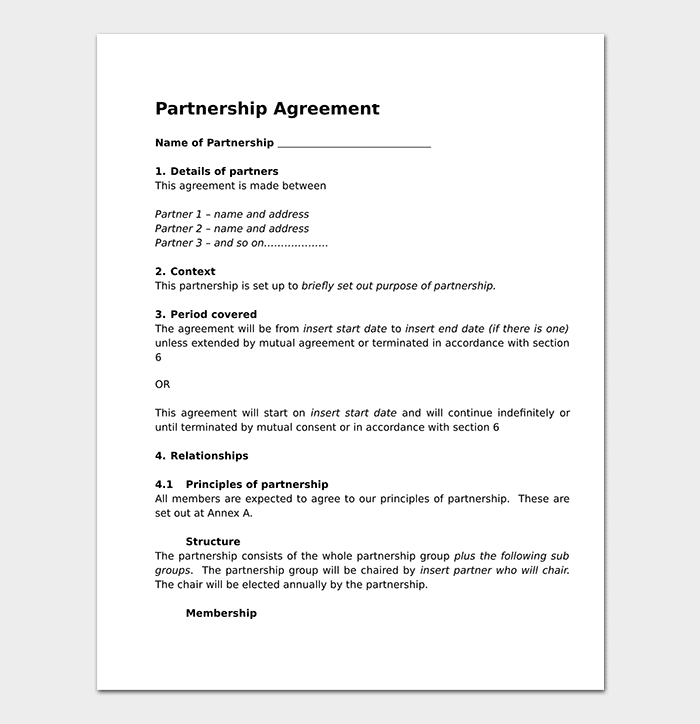 Since when partners are starting a business it looks like everything is fine, partners may not see the need for this document. It is essential to note that this will not always be the case as things change as the business progresses.